We love Mardi Gras (and so does Mickey)!! It's that time of the year when the air is cool, sweet and full of candy! Yep, Mardi Gras parades-lots and lots of them. 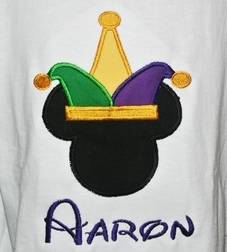 Disney does Mardi Gras beautifully and it is so much fun! 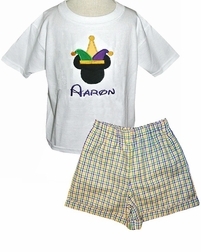 The traditional colors of Mardi Gras are of course yellow, purple and green. 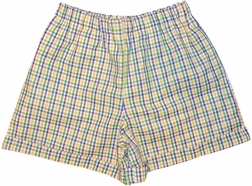 Using this famous color scheme we take purple gingham and make it into a John John, longall or white shirt and gingham shorts. You can also just purchase the shirt. 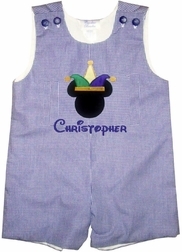 The shoulders of the John John fasten with purple buttons and the front of it and the white shirt are appliqued with a fun loving, partying Mickey Mouse wearing a Mardi Gras jester hat!